In the modern scientific era, catalysis occupies an important place in both academic research and industry with considerable potential of applications in everyday life including fine chemicals, agrochemicals (synthesis of pesticide, fertilizers), pharmaceuticals, petroleum (in oil refining, biofuel production, fuel cells etc. ), polymers (plastics, adhesives), electronics, and environmental clean-up (limiting the emission of noxious gases from automobiles and stationary sources, removal of CO and odors from indoor air, and cleaning of groundwater). According to the recently published report entitled “Catalyst Market – Global Industry Size, Share, Growth, Trends and Forecast 2012 – 2018” the worldwide market value of catalyst was at 19.2 billion USD per annum in 2014, and is expected to reach USD 24.1 billion by 2018. The use of catalysts technology is well known from the ancient time, although the concept of catalysis was not clear at that time. This includes the formation of alcohol from sugar by fermentation, synthesis of soap by hydrolysis of animal fat using caustic potash, conversion of alcohol to ether catalyzed by sulfuric acid. In 1836, the term ‘catalysis’ was coined by Swedish chemist Berzillius, and Ostwald in 1895 scientifically explained it as: “a catalyst accelerates a chemical reaction without affecting the position of the equilibrium.” In 1909, Ostwald was awarded with noble prize for his pioneering work in this field. Catalysts are primarily categorized into four types. They are (1) Homogeneous, (2) Heterogeneous (solid), (3) Heterogenized homogeneous catalyst and (4) Biocatalysts. 1) Homogeneous catalyst: In homogeneous catalysis, reaction mixture and catalyst both are present in the same phase. Both catalyst and reactants show high homogeneity which results in high interaction between them that leads to high reactivity and selectivity of the reaction under mild reaction conditions. Some examples of homogeneous catalysts are brønsted and Lewis acids, transition metals, organometallic complexes, organocatalyst. Some notable chemical processes that occur through homogeneous catalysis are carbonylation, oxidation, hydrocyanation, metathesis, and hydrogenation. 2) Heterogeneous catalyst: In heterogeneous catalysis,catalysts exist in a different phase than the reaction mixture. Some of the exemplary processes that use heterogeneous catalysts are Haber-Bosch process for the synthesis of ammonia, Fischer–Tropsch process to produce variety of hydrocarbons. Heterogeneous catalysts dominate major industrial processes because of the easy separation of product and recovery of catalyst. Heterogeneous catalysts may be used as fine particles, powders, granules. These catalysts may be deposited on the solid support (supported catalysts), or used in bulk form (unsupported catalysts). Supported catalyst play a pivotal role in industrial revolution. As heterogeneous catalysis is a surface phenomenon, performance of catalysts depends on the exposed surface area. Exposed surface area increases with decreasing particle size but the smaller particles tend to aggregate and result in deactivation of the catalyst. Tethering of catalytic active site on solid support prevent the agglomeration of catalytic particles, hence improve the catalytic performance. For industrial application, solid supports considered to have high chemical, mechanical and thermal stability. In addition, it must be inert and high surface to volume ratio. Generally used organic solid supports can be polymers (e.g. polystyrene), copolymers (e.g. styrene-divinylbenzene) and inorganic supports such as silica, zeolites, alumina, activated carbon, titanium dioxide, graphene. Unsupported catalysts occupy the large section of industrial catalysis. This includes metals, metals alloys, metal oxides, metal sulphides, zeolites etc. 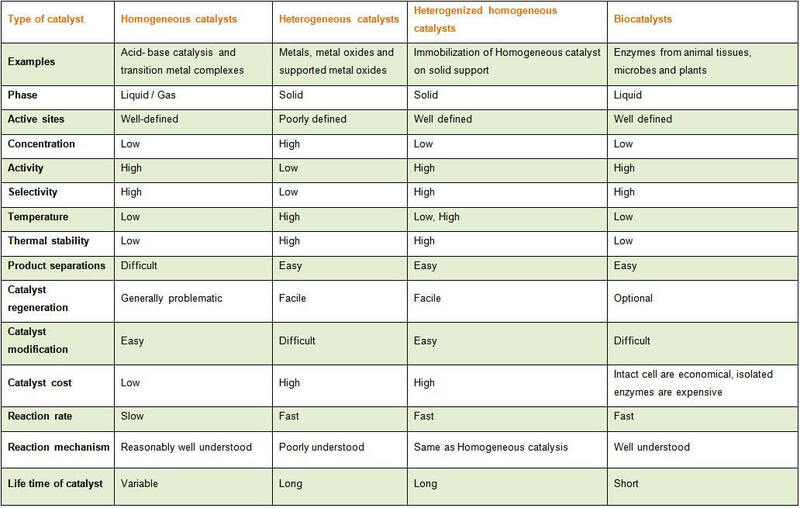 3) Heterogenized homogeneous Catalysts: Heterogeneous catalysts in contrast to their homogeneous counterparts are much more difficult to develop practically. One reason is their complexity, which precludes their analysis at a molecular level and development through structure–reactivity relationships. In addition, traditional heterogeneous catalysts (metal oxides or supported metals) exhibit less selectivity and reactivity. In order to surmount these issues, homogeneous catalyst is grafted onto the solid supports to prepare their heterogenic analogs. Presently, the solid supported homogeneous catalysts are widely recognized and well exploited in the academic and industrial research. The aim of this approach is to overlap the positive features of both homogeneous (selectivity and reactivity) and heterogeneous catalyst (reproducibility) and this can be achieved through the immobilization of catalysts such as metal complexes, organometallic compounds on the solid surface either through physisorption or chemisorption. Covalent grafting of catalytic active species on solid surfaces is found to be most favored approach for designing heterogenized homogeneous catalyst. 4) Biocatalysts: Natural proteins (enzymes) or nucleic acids (RNA or ribozymes and DNAs) used to catalyze specific chemical reactions outside the living cells is called biocatalysis. Enzymes are obtained from animal tissues, plants and microbes (yeast, bacteria or fungi). High selectivity, high efficiency, eco-friendliness and mild reaction conditions are the driving forces for their large scale utilization and making biocatalysts an alternative to conventional industrial catalysts. Significant progress in the field of protein engineering and molecular evolution has revolutionized the world of biocatalysis for the industrial scale syntheses of fine chemicals, active ingredients (APIs) biofuels (e.g. lipase for the production of biodiesel from vegetable oil), dairy industry (e.g. protease, lipase for lactose removal, renin for cheese preparation), baking industry (e.g. amylase for bread softness and volume, glucose oxidase for dough strengthening), detergent manufacturing (e.g. proteinase, lipase, amylase used to remove stains of proteins, fats, starch, respectively) leather industry (e.g. protease for unhairing and bating), paper industry, textile industry (e.g. amylase for removing starch from woven fabrics). Immobilization of enzymes on solid supports turns enzymes into heterogeneous solid catalyst which enhances the activity, stability and increase the life time of catalyst that can be reused for many cycles. In the recent years, significant development and advancement have been made in the field of catalysis. With the ever increasing demand of non-renewable natural resources, clean air, chemicals and pharmaceuticals, catalysts will remain at the forefront of chemical research and development. Catalysts have enabled us to synthesize complex molecules in fewer steps, and also have been successfully utilized in refineries to produce low Sulphur fuel. Catalysts have also been instrumental in the reduction in emission of CO, NOx, unburned hydrocarbons from the vehicles that operate on the combustion of petrol, diesel and jet fuel. Still there are many issues associated with the widely used catalytic systems, including the cost, availability, toxicity of many of the precious metals used as catalysts and the need of expensive and complex ligands to achieve the desired transformations. Scientists and Chemists focus on the designing of catalysts with high selectivity, reactivity, stability, low catalyst loading with high turnover number. Recent developments in nanotechnology provide new opportunities for design and synthesis of nanostructured catalysts with high surface area and exposed active sites, which ultimately leads to high catalytic activity. The concept of combining organocatalysts and transition metal catalysts has recently gained attention for its use in organic synthesis, where the metal portion provides high activity and the organocatalyst portion provides high selectivity. Although, a variety of organic transformations have been successfully accomplished by using metallorganocatalysis which were not achievable with either type of catalyst alone. Plenty of room still remains unveiled, which spans from the delicate designing and combination of primary building units and finally to demonstrate their application in different fields of catalysis.